Pride Paws held their ninth annual Pins 4 Pride fundraiser on April 28. Michael Hofmann, Alec Ritzel, Nicole Schroeder, Emily Mathis and Alicia Headley at the ninth annual Pride Paw’s fundraiser, Pins 4 Pride, on April 28. Pride runs deep at Pride Paws retail store, located at 26 S. Main St. in Medford. Pride Paws is a nonprofit organization that was founded in September 2010 and sells pet treats, toys and accessories. The mission of Pride Paws is to provide job training and transitional services to individuals with developmental disabilities through the work experience offered at Pride Paws. The idea of Pride Paws was started through a collaboration of parents and teachers of the Lenape Regional High School District who were concerned with what the next step for the children would be once they finished high school. Sarah Moretti and Kate Maloney were two of the teachers who were compelled to take action, and currently assist in the nonprofit, along with Joe and Linda Ritzel, Ed Schroeder and Ron and Joanne Powell. So far, more than 70 participants have been provided transitional employment opportunities through Pride Paws, and students currently enrolled in the Lenape Regional High School District programs have been given the opportunity to come to Pride Paws for day trips to allow them to help. The participants at Pride Paws can join right out of their high school program and continue until their 30th birthday. There is a 200-hour training program that all participants take part in, where they cover an array of job skills, including resume building, communication and retail skills, baking, sewing and more. Once they complete the training program, they have the option to continue with Pride Paws as an employee until they turn 30, or they can take those skills and use them at other employment opportunities. Manager Hailey Heikkinen has been working with Pride Paws since 2016, and volunteered at the organization for a year prior. “I like to see the progress participants make as they become more independent and to see our participants gain confidence to do things on their own,” Heikkinen said. Pride Paws relies on the support of the local and extended community to fund operation costs of the store. It holds multiple fundraisers throughout the year to support these costs, including its largest and most recent fundraiser, Pins 4 Pride. 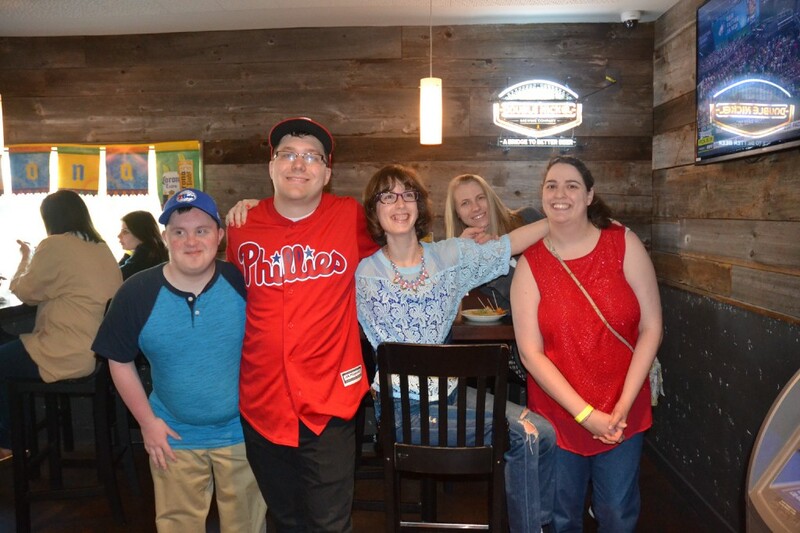 The ninth annual Pins 4 Pride fundraiser was held at Pinsetters in Merchantville on April 28. People were invited to bowl, participate in the raffle baskets and auction items, as well as enjoy the food and drinks that were provided. Pride Paws’ has two upcoming fundraisers, including one on July 23 at Citizens Bank Park, where people can purchase tickets to attend the Phillies game with Pride Paws store participants, and receive food and drink specials at Xfinity Live before the game. Tickets can be purchased on its website, http://www.prideventuresinc.org, beginning June 1. They are also hosting a fundraiser on Sept. 24 at PJ Whelihan’s in Medford. From 5 p.m. to 8 p.m., 15 percent of the bill will go toward the nonprofit when Pride Paws is mentioned to the server. President Joe Ritzel encourages everyone to come out to the fundraising events to support the organization and to meet current and former participants who have since found employment with their skills gained at Pride Paws. Pride Paws hopes to expand and accomplish its goal of instilling a positive work ethic to all participants and help them reach their personal highest level of achievement.